Following such an astounding year in 2007, and amid a formidable array of high-powered classic and contemporary racing cars, many recognised that Toyota’s small, three-wheeled i-REAL concept was one of the standout machines of the 2008 event. In its first UK appearance since being unveiled at the Tokyo Motor Show, the fully working i-REAL was the second personal mobility concept Toyota had displayed in the Technology Pavilion in as many years. 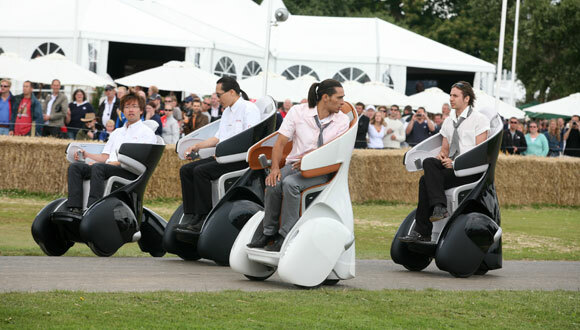 Demonstrations were conducted on the hill climb course and in a specially designed arena near the exhibition, which showcased the i-REAL’s ability to adapt to different driving environments: upright and slow-moving among pedestrians; lower angled for stable performance at higher speeds on the road. 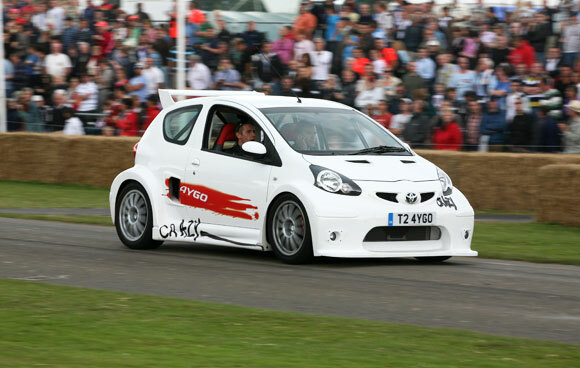 Another antidote to the wild concept cars that look great in static display but never turn a wheel in reality came in the form of Toyota’s ‘shopping supercar’, the appropriately titled Aygo Crazy. 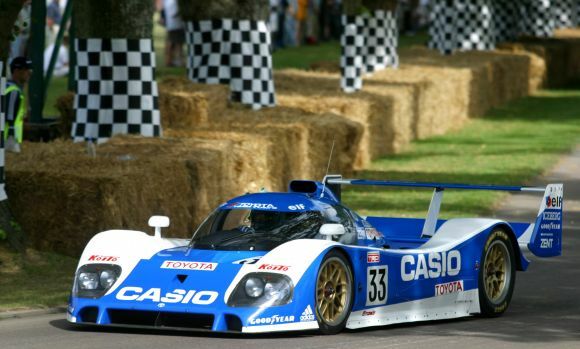 Making its debut at Goodwood just days ahead of its star placement on the Toyota stand at the British International Motor Show, driving ace Peter Dumbreck was under strict instructions not to wreck the mid-engine machine during his blast up the hill. It may have offered two-fifths of the power of Peter’s Super GT Lexus but the Crazy was nevertheless a bit of a handful. 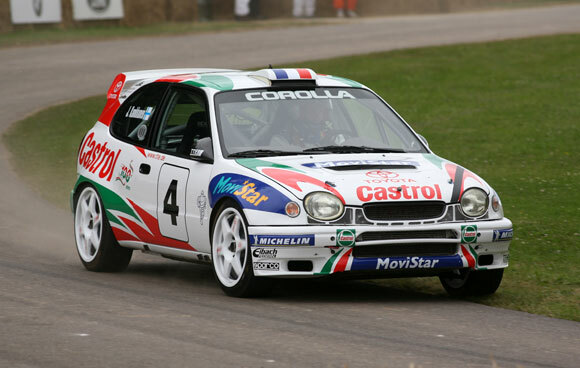 After bringing along a run of WRC Celica GT-Four models in previous years, 2008 marked the first Goodwood appearance of the Corolla WRC, a car that was hailed as the definitive World Rally machine when it made its competition debut in 1997. For three consecutive seasons it posted a string of emphatic performances, culminating in a second manufacturers’ title for Toyota in 1999 — a fitting finale to two decades of Toyota’s involvement in international rallying. 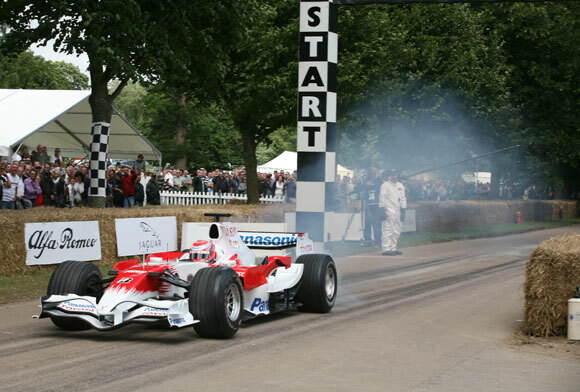 Ever since it started attending the Goodwood Festival of Speed, Toyota brought along its latest Formula 1 car. This tradition continued in 2008 with the TF107, with newly recruited third driver Kamui Kobayashi taking the wheel up the hill. Kobayashi was talent-spotted in the Toyota Young Driver Programme and catapulted into the limelight when he achieved international success in Formula 3. Completing the trio of world-class Toyota models at this year’s Festival was the thoroughbred V10-powered TS010 Le Mans Prototype racer, another regular at this event.